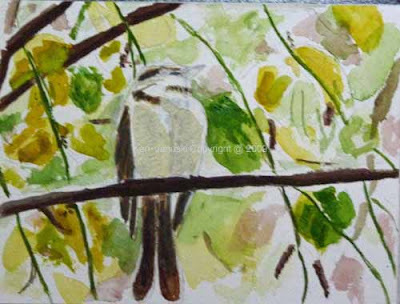 I've done some more work on the Acadian Flycatcher this morning. This time the newest version is at top with the older versions beneath it. As usual I'm wary of overworking it and losing all of that brightness and luminosity that watercolor is capable of. The danger of this of course is that I leave a half-finished work, thinking that it is done. That is the same old story of watercolor. I'm sure over time that expert watercolorists know when to call it quits and when to try to improve it just a bit more. For today though, this is it. Time to let it marinade! This will be a quick post before heading off to work. I've been getting in the habit of doing some art work most mornings and I'd like to continue. However I rarely have time to drive somewhere and work from life so most of my work is based on photos that I've taken. 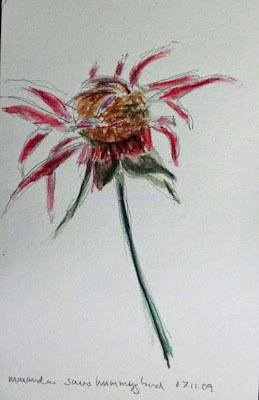 I use a Strathmore Field Sketchbook for many of my watercolors. It includes interleaved lightweight sheets of drawing paper and heavier watercolor paper. I use the first to map out the composition as above. Then I use the second to do the actual watercolor. Hopefully the sketch on the watercolor paper includes something that I've learned from the first sketch. In this case this is my second version of a painting from this photo or one similar. The first was an abysmal failure. One problem is foreshortening. I'm looking up at the flycatcher. The second, and this is a problem with photos, is that the tail doesn't seem centered under the torso. It's off to the left. If I were drawing from life I'd know whether this was correct or not. But here I'm left with the evidence from the photo. I know that it's highly unlikely that the tail really was off center. But it could have appeared off center. Most likely it did, though I don't know how. In any case this first version of the new watercolor remains fairly true to the photo. A bigger problem will probably be the background. I've roughly sketched in what I'd like to do in the first sketch. Only time will tell if I'm able to accomplish it in the actual watercolor. I think it's three weeks in a row now that we've spent a few hours birding at Morris Arboretum in Philadelphia on Sunday. We've birded there for years but I think what has motivated us to get there three weeks in a row is my desire to work from life. Because the highlight of Morris birding is the pond there are a lot of water birds, some shorebirds, a variety of other birds, and maybe most important the space to put up a scope and get a good look at many birds. Over the last three weekends we've gotten good looks at Wood Ducks, Belted Kingfishers, Ruby-Throated Hummingbirds, Kildeer and Eastern Kingbirds among others. Both I and my wife have been able to do a number of sketches. Mine from this weekend(seen at top) are primarily Wood Ducks and ducklings, a Great Blue Heron and a Ruby-Throated Hummingbird. 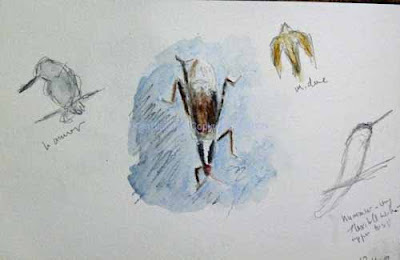 The small watercolor pencil sketches I did in the backyard last weekend. 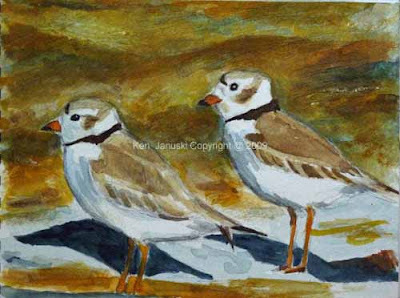 I've been preaching the virtues of working from life for years but it's only this summer, partially through the influence of the Wildlife Art forum at birdforum.net, that I'm really trying to make a regular habit of it. I have to add that Debby Kaspari at her blog has suggested working from life for years as well. But for some reason seeing so many people working from life at the wildlife art forum was enough to finally push me over the edge. Happily, my wife Jerene, has also been doing her own sketches. So this is working out well for us. There's still a long way to go but I'm already seeing progress. One of these days maybe my more finished drawings and paintings will actually be based on live fieldsketches rather than photos that I've taken. I can't remember how many years ago it was that Morris started developing its entrance, and Paper Mill Run, as a wetlands area. I'd say at least five and probably more. Over recent years it's become a better and better spot for birding. Shorebirds, herons and egrets, warblers, vireos, ducks, raptors can all be found there and all on the same day. We first started going to the Arboretum to see the trees and shrubs, which are of great interest to us, but since the wetlands appeared we never do much at the arboretum other than bird the wetlands. But on a slow day there always are the shrubs and trees to admire. Today's highlight I think had to be blooming Ironweed and Joe Pye Weed. 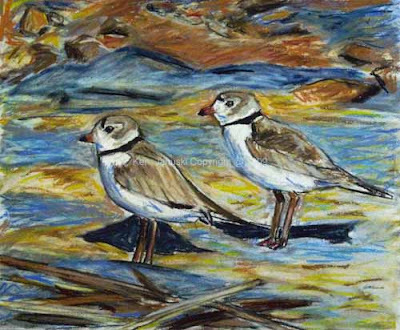 These benign looking Piping Plover have given me a surprising amount of trouble over the last week or two. First there was the disastrous watercolor of a week ago. Then over the last two days this combination pastel/charcoal. 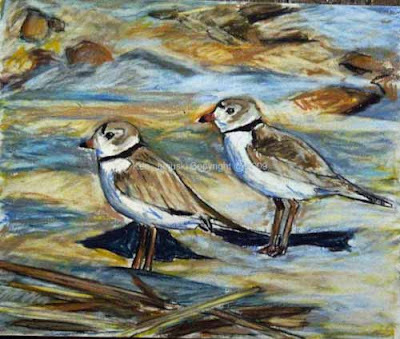 The problem really has nothing to do with the plovers. It's the background that causes problems. I'm trying to keep both the brilliant light of the sand and the variations in tone: yellow/ochre and blue. It seems like I can't have both. If I accentuate the color contrast it no longer looks like brilliant whitish sand. Today I had the opposite problem. I erased the pastels enough that there was a more uniform light color. But then it looked dull! In the last and probably final version above I've made the top part of the drawing a bit darker and richer in color. There was no such orange on the sand or in the photo. The last blue area of shade was not so dark and blue. But I felt that I really needed to differentiate this more distant area from the more sun-drenched area where the plovers stood. So I've taken some artistic license in what I hope is both a good drawing and a drawing that is more or less faithful to its subject. I have to add that its very overcast today. After I work on the drawing for awhile I take it outside to spray on fixative. What a surprise! A brand new drawing when seen in the brighter light of outdoors. Mainly it's looked dull and monotonous. So that's one more reason that I added the darker, richer colors at top. 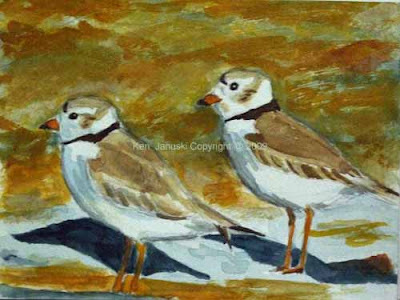 Piping Plovers are obviously very beautiful birds. This is the third version of a painting or drawing that I've done based on the photos I took of them in April at Cape May. I think it's time to change subjects for awhile. But I may still try one more watercolor in the future. I'd still like to get them and their surroundings in one brilliantly lit painting. 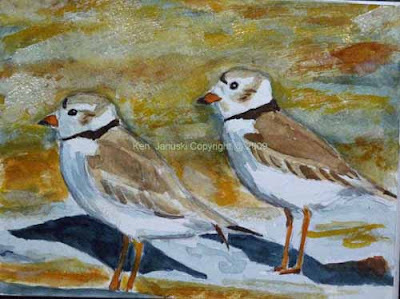 I wasn't happy with my last watercolor of the Piping Plovers. I've reworked it once again but am not posting it now. Instead I started a new pastel and charcoal drawing of the same subject. I'm a little more confident in my abilities in charcoal, and to a lesser degree pastel, than I am in watercolor. I'm including the first two versions of the drawing. I'm fairly confident that by the time I'm finished I'll be happy with the work. Well sometimes things just don't work out. 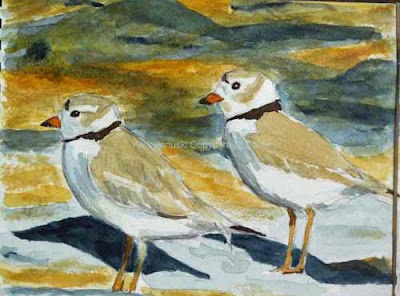 I'm afraid that's the case with the Piping Plovers watercolor. I'm including four or five different photos here showing the various tacks I took in trying to salvage this watercolor. It's a bit painful to me to watch but it may prove informative to some. Not all artworks are successes but sometimes it's interesting to see the process as it goes along. After letting it dry I decided that the top half was just too dark. It would be better to make that area more uniform in tone and color. But because I'd already worked it so thoroughly I couldn't figure out how to salvage it, in particular how to put a lighter area on top of the dark blue area. I began by going opaque and adding colors with white added to them to the top half. That looked bad so I decided to use a wet sponge to remove as much paint as possible. The top photo shows this stage. That got rid of the darker areas but also created an overall light muddy tone to the top. All white paper disappears when you do this. You get a lighter overall tone but also one that is permanently muddy. So I thought maybe I could use a color at full strength, particularly one that was somewhat opaque, to try to revive the area. It might just be opaque enough to cover up the gray tone. That helped somewhat but the top still looked very dull. So I experimented some more. Stupidly I went back to a method that had already failed, adding more white to the top as seen above. That was a disaster as you can see in the photo above. Finally I went back in with some undiluted, full strength colors. My thought was that they might be bright enough, since they were full strength, to overcome the muddiness. The danger of course is that now I was painting more like oils or gouache and not at all like watercolor. But I'd become desperate to try to salvage this. You see the results above. At this point I think the watercolor looked worse than when I started reworking it so I decided to leave it sit overnight. I didn't think there was much more I could do with it. This morning I looked at it again. The ochrish background just seemed too strong so I tried some small experiments, scrubbing out, scraping the paper, and adding in some more color washes. At this point I think it's done. It somewhat holds together as a painting. The original background as seen in the photo of brilliant sand, with blue and orange washes, is completely gone. Instead this looks more like some sort of hilly terrain. So my original idea of showing the brilliant sand in its two colors has completely failed. Still nothing ventured, nothing gained. Readers might wonder why I'm showing such a disaster. Well I hope that maybe it's informative. Most artists go through similar problems but often don't want to mention their failures. Most likely this is a failure. But the thing to do is learn from it and go on to the next success. That's the story of art. The other side of this scenario is that from a distance the plovers completely disappear into the sand. So though it has orange and blue casts it also looks like just one color from a distance. So as I developed this watercolor I didn't really have a good plan. I just improvised with the sand, going back and forth between a strong contrast and a weak one. I also used a broad brush, rarely trying to get the texture of the sand. My problem is that I just wouldn't wait for the first coat of watercolor to dry. So as I went back and forth with different ideas about the sand I kept going back into wet watercolor. Sometimes this works. At other times it can lead to a muddy mess. I'm not sure where I'm at here but I suspect I'm pretty close to a muddy mess. So I decided to stop and write this post, forcing myself to let the watercolor dry, and also forcing myself to take a break and look at it without a paintbrush in my hand. Most likely I won't touch this again until tomorrow. I hope I can do something to resolve any possible muddy messes. 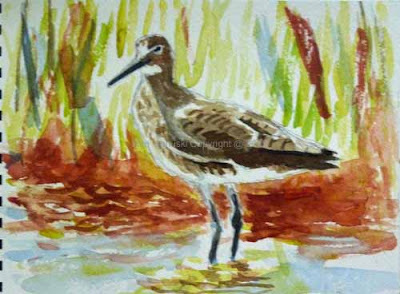 I believe this small watercolor of an Eastern Willet seen at The Wetlands Institute in Stone Harbor, NJ this year is done. 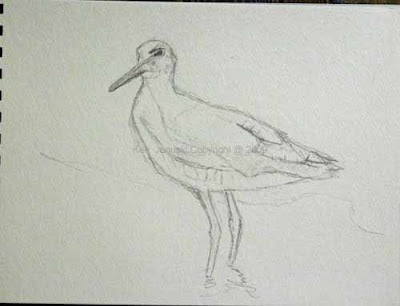 I'm satisfied with it, especially as it's my first painting of a willet. More than most artistic mediums though, watercolor doesn't do well with a lot of reworking. So even though there are some parts that bother me, I think it's best to leave this as it is, while it still has some freshness. Though Eastern Willets are fairly common shorebirds we'd only seen them a few times before, the first time being when we took a Cape May Birding Observatory workshop on spring migration. They have never been all that close. On our trip to Cape May this April they were all over the place. This bird was only about 10 feet away. So it was nice to be able to get such good looks at them. They are a fairly nondescript bird for a shorebird, though their bluish bill and legs are noticeable. Their feather markings though are pretty much the same all over. There are no noticeable areas of contrasting color that stand out. At least not until the willet flies when you do see a huge white stripe on the wings. 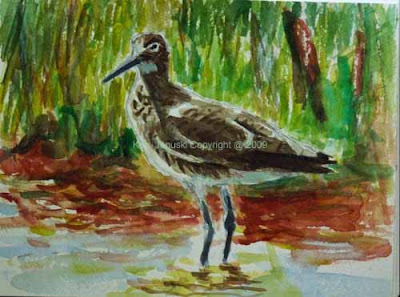 Now that I'm starting to force myself to work from life I hope that my next paintings of Willets will include some work from life. Hopefully that will be soon! A very quick post this morning before heading off to work. I didn't have time to do any work from life today so decided to return to watercolor and photos. This is the beginning stage of an Eastern Willet seen at The Wetlands Institute at Stone Harbor, NJ this spring. As usual the question is can I keep this watercolor alive? Stay tuned! I continued my quest for more live field sketching today and was able to convince my wife to do the same! We spent about 2 1/2 hours at Morris Arboretum in Philadelphia. 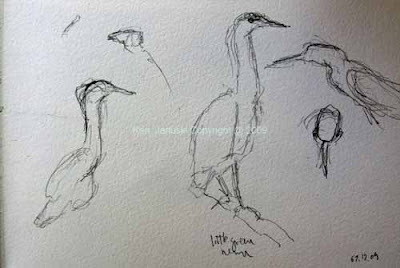 We hoped that we'd finally see a Green Heron there and sure enough we saw one very quickly and were able to get many looks and do a number of live sketches. But the most exciting part of the trip was shorebirds. We're still beginners with shorebirds. We tend to see them at Cape May in the fall and this year in the spring. So we've finally started to at least have a handle on them. We generally can at least differentiate a sandpiper from a plover. As I've continued to read about them one truism I've run across is that they're migrating back south by July. But we never see them in summer. Maybe we would if we went to the shore in July. But we just don't see them in Philadelphia. 07.13.09 edit -> I should say "we don't see them." Others might. If we spent more time at Tinicum in summer I'm sure we'd see more shorebirds there. In fact we may need to test that theory very soon. One of the pleasures of birding is when you actually see something that you've read about. That happened today when we found five species of shorebirds: Killdeer, Greater Yellowlegs, Spotted Sandpiper, Solitary Sandpiper, and Pectoral Sandpiper. The more we looked the more we found. I assume that all, except possibly the six Kildeers, were migrating. We had to puzzle through the Pectoral but I'm pretty sure that's what it is. It was smaller than normal but fieldmarks indicate that it's a female, which is smaller and migrates in mid-July. 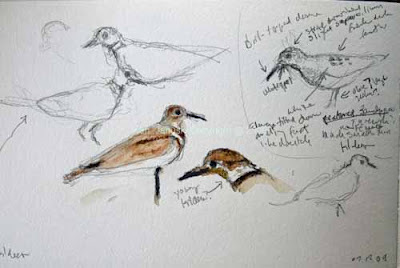 The sheet of Killdeer drawings includes the Pectoral in the upper right corner. After looking at more guidebooks, getting a suggestion that it is a juvenile Pectoral, and looking at my notes (e.g. olive legs, always crouched, etc.) I'm now wondering if this could have been a Least Sandpiper. The clean line that ended the streaking on the breast convinced me it was a Pectoral. But it did seem sort of large for a Pectoral (which is one reason I thought female which are smaller), it was often in a crouched position like a Least, and the legs were sort of olive. And they seem to be early migrants based on what I've read. So many things point to a Least. Except the clean line on the breast streaking, which still indicates a Pectoral. So even with all my sketching and notes it may remain unknown for certain. 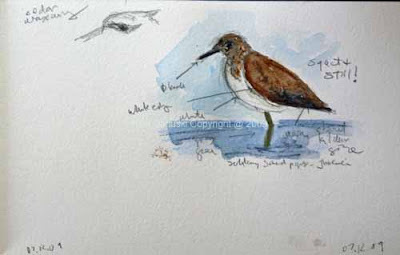 There's also a bad sketch of a Solitary Sandpiper. What's worst about it is that I've lost all of the white on head and neck. So it's both dull to look at and wrong in fact. Nonetheless I noted enough details as I drew it to clearly identify it when I went to the guidebook. 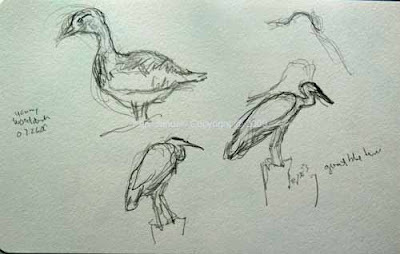 Which leads me to another reason to sketch birds: so that you SEE them better. There is an ongoing discussion on the PA Audubon birding list today about whether it might be wise to buy a good camera before good binoculars if you have an interest in birds. Most people chose binos, and I certainly would, but some people suggested a camera. My suggestion: buy the best binocular you can buy, and a sketchbook. 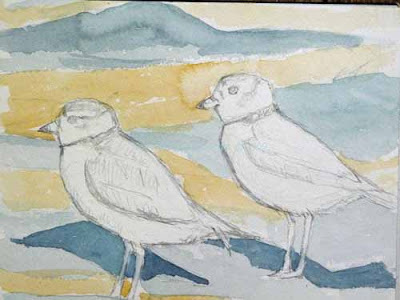 Drawing a bird forces you to LOOK at a bird and make decisions about fieldmarks that you don't have to do with binoculars and surely don't with a camera. I was even reading elsewhere about people shooting photos and then going home and comparing them to a guidebook to figure out what they'd seen. This seems crazy! The beautiful thing about sketching, regardless of your ability, is that it forces you to look more closely. I was tempted to ask the person who wanted advice on binoculars or camera if he wanted to bring home anything from the experience. If you want to bring home a trophy a camera will work, though you'll probably be unhappy with the quality of your trophy. It's not that easy to get a good photo. 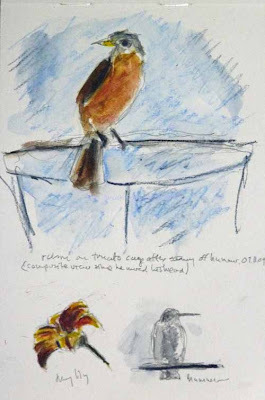 But if you want to bring home a better understanding of birds, an improved ability to identify them, and maybe an art work, then buy yourself high quality binoculars, AND, a sketchbook! 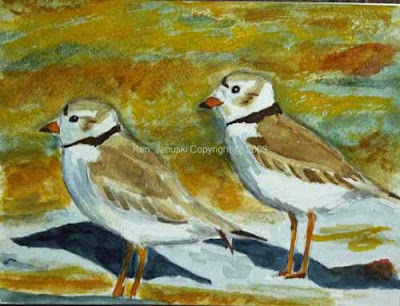 I've spent the last week thoroughly immersed in the wildlife artist forum of birdforum.com. I was led there by Jo through a reference to the work of Nick Derry in my last post. What an enjoyable trip it's been. There are some really, really good bird artists there. More important, at least to me, is that not only is it good but much of it is based on field work. It's both observation-based and artful. To make a long story short the time spent there has convinced me that I really do need to spend more time working from life. There is just no way around it. Fieldwork is what keeps you connected to the subject. So today I forced myself to work from life. Today I stayed in the backyard. Tomorrow I may go afield, if I can convince my wife that she'd also enjoy it. I knew that we have had a hummingbird around quite a bit the last two weeks so I wanted to see if I could get some sketches of it. And I knew I needed to avoid 'the near temptation of lens.' No photos. I wanted to draw what I saw with my naked eye, or through binoculars, unadulterated by a camera. 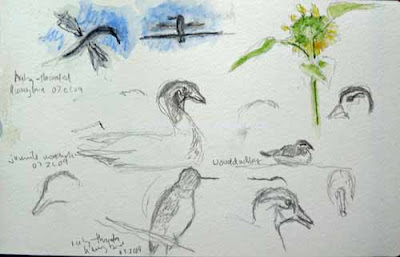 As you can see I managed a few very small hummingbird sketches. It just didn't sit still. The one time it looked like it might (see bird on wire) a robin landed on tomato cage and scared it away. That sketch is really from a mental image. Even the robin wouldn't sit still. So his sketch includes two composite views. 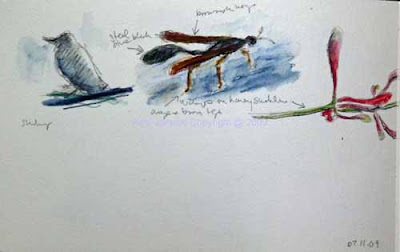 Unidentified wasps and beetles landed on my drawing table or on the honeysuckle next to my chair. So they also got included. I've spent years drawing insects under a microscope but this was one of the first drawing them live. Wasps don't sit much more still than birds. I haven't identified this one but if I have time I'll do so later. Actually I think I have identified it. It's one of the thread-waisted wasps: a mud-daubing wasp. 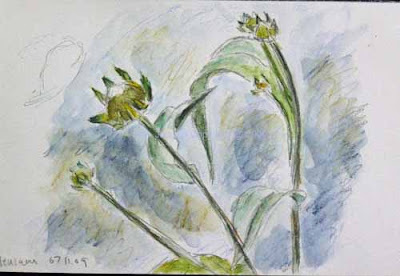 The final subjects are floral: a helenium just budding up, a half-spent monarda and a honeysuckle blossom. The hummingbirds love the monarda and the honeysuckle. As common as monarda is it is really a spectacular flower. I don't think most orchids can top it for exotic beauty, especially if you look closely at each flower. There aren't any great drawings here. But it was great fun forcing myself to work from life. I enjoyed it so much I didn't even notice I was using my old nemesis, watercolor pencils and waterbrush. 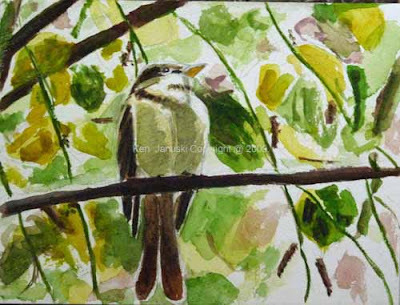 I began drawing and painting birds in late 2006. 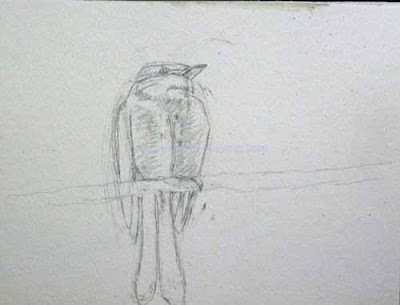 The inspiration, outside of years of birdwatching, was the book 'Drawing Birds' by John Busby. 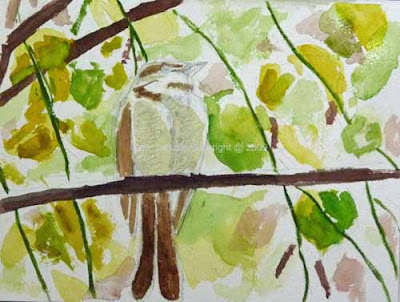 I loved the plein air versions of birds that I found in it. They crackled with life. My own artistic background, outside of 3-5 years drawing insects in pen and ink viewed under a microscope, was 20-25 years of mainly abstract or non-objective work. But I'd become very disillusioned with the art world and had stopped doing abstract art. 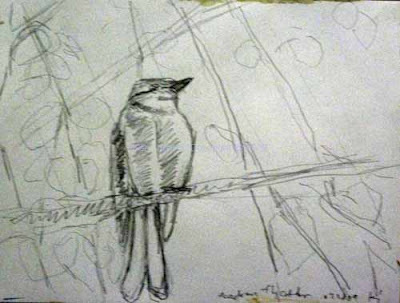 After reading 'Drawing Birds' I was so excited about what I saw that I decided to try my hand at naturalistic art, using birds as subjects. 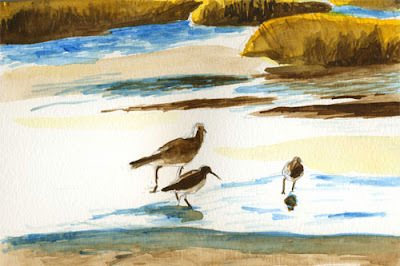 The small watercolor at top, of shorebirds at Nummy Island near Cape May, NJ was my first bird watercolor. It was done in late 2006. But I soon ran into a problem. 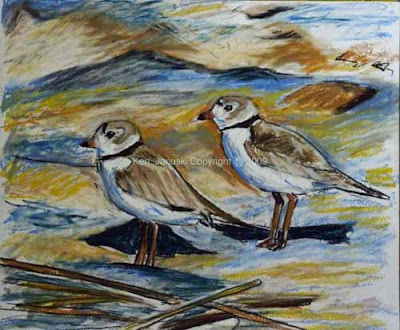 As I started looking at 'wildilfe art', includng 'bird art', I found that most of it just left me cold. I don't want to elaborate on that here. If I had to generalize I'd say that it felt overly-precise and lacking in life. 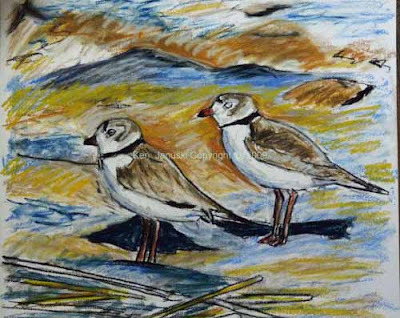 I also reviewed 'Lars Jonsonn's Birds' at Amazon earlier this year and it is a stunning example of someone who does work that is both naturalistic and artful. So this is turning out to be a good year for me and 'wildlife art.' I keep finding more and more that I really like. There is of course a great tradition of European and American artists who have been great artists while still using naturalistic subject matter. Durer, Courbet and Homer spring instantly to mind. But that seems less true since the 1900s. This is a huge subject that I really don't want to tackle in any depth. It may be due to the decline in popularity of representational art in the 'high art' world during most of the 20th century. But for whatever reason it seems to me that the most accomplished art and naturalistic art have been two different genres for 100 years or more. I don't see any reason that this should be the case. And I'm very happy whenever I find naturalistic art which also seems to be in the tradition of the best and most accomplished art. That's been the case this year.